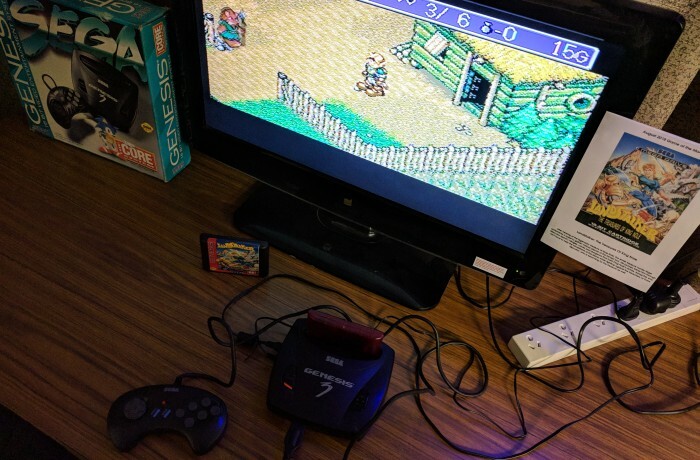 I bought along a Genesis 3 playing our Game of the Month – Landstalker: The Treasures Of King Nole. Following our theme – Blue – Angela and Robert brought along a Pokemon N64 but neglected to bring the memory cartridge so they were unable to play anything. They also brought a blue DSi running a Sonic game and a blue Wonderswan. William brought his Super Nt along with a number of games in blue cartridges. Peter had his modded SNES Classic Mini running Echo the Dolphin (more grey than blue) and the Colecovision Smurfs game. Matthew had his @Games Sega Mega Drive Classic Game Console. We ran a High Score Challenge using the 5 minute Caravan Mode of Metal Slug 3 on the Nintendo Switch connected to the projector which Leigh won. During the 9pm announcements we discussed retro related news items as well as our Game of the Month – Landstalker: The Treasures of King Nole (SMD) – and voted on the October Game of the Month – Paper Mario (N64).